Ecuador is a country with endless natural richness. The geographic and climatic diversity of its four regions have given rise to thousands of unique species of flora and fauna. 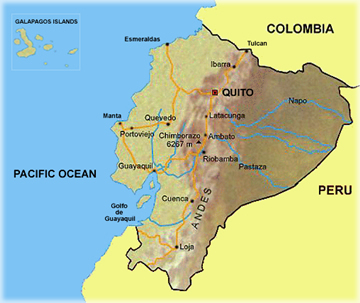 Within a short time the traveller can experience dramatic changes in scenery, temperature and altitude, journeying between Pacific coast beaches and the sweltering, mosquito-ridden rainforest; to the charming capital city of Quito surrounded by ice-covered volcanoes; and to colorful highland markets that add character and warmth to the windswept highlands of the Andes Mountains.